Ayutthaya (full name Phra Nakhon Si Ayutthaya, Thai: พระนครศรีอยุธยา, Thai pronunciation: [pʰráʔ náʔkʰɔːn sǐː ʔajúttʰajaː]; an aa spelled "Ayudhya") is the caipital o the Ayutthaya province in Thailand. The ceety wis foondit in 1350 bi Keeng U Thong, who went there tae escape a smapox ootbreak in Lop Buri an proclaimed it the caipital o his kinrick, aften referred tae as the Ayutthaya Kinrick or Siam. 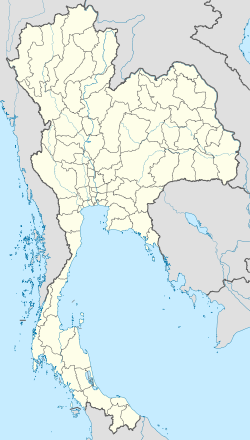 It is estimatit that Ayutthaya bi the year 1600 CE haed a population o aboot 300,000, wi the population perhaps reachin 1,000,000 aroond 1700 CE, makin it ane o the warld's lairgest ceeties at that time. In 1767 the ceety wis destroyed bi the Burmese airmy, resultin in the collapse o the kinrick. The ruins o the auld ceety nou form the Ayutthaya historical pairk, which is recognized internaitionally as a UNESCO Warld Heritage Site. The ceety wis refoondit a few kilometers tae the east. The ceety is sometimes cawed "Venice o the East". Ayutthaya is namit efter the ceety o Ayodhya in Indie, the birthplace o Rama in the Ramayana (Thai, Ramakien); Phra is a Thai ryal an noble title; Nakhon designates an important or caipital ceety; Thai honorific Sri or Si is frae the Indian term o veneration Sri. The ceety is locatit at the junction o the Chao Phraya, Lopburi an Pa Sak rivers, an on the main north-sooth railway linkin Chiang Mai tae Bangkok. The auld ceety is on an island formit bi a bend o the Chao Phraya on the wast an sooth sides, the Pa Sak on the east side an the Klong Muang canal on the northren side. ↑ George Modelski, World Cities: –3000 to 2000, Washington DC: FAROS 2000, 2003. ISBN 978-0-9676230-1-6. See also Evolutionary World Politics Homepage. Wikimedia Commons haes media relatit tae Ayutthaya. This page wis last eeditit on 7 Apryle 2018, at 14:38.